On July 12, a barge exported to the South Korea, which is 92.5 meters long, was launched successfully in Nantong of Jiangsu province. After one week testing, the barge was delivered to customer. 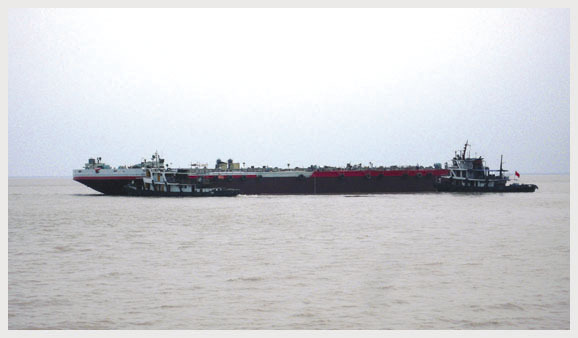 The contract on barge project was formally signed on July 24, 2008. During the following one year, CNAICO sent two representatives to the shipyard to supervise the progress of the project and ensure the smooth implementation of the project and timely delivery. They also worked together with the Korean Register of Shipping to ensure security test and certification. According to Korea Express Co. Ltd., the largest comprehensive logistics company in Korea, It chose CNAICO as partner for the barge project because of CNAICO抯 abundant experience and market prestige accumulated from several previous projects and Korea Express feels particularly satisfied with CNAICO抯 advanced operation philosophy and its professional and cooperative attitude. The barge will be used for transportation of goods to help expand the company logistics service.